What Can the Video of Hae Min Lee's Sentra Tell Us About the Windshield Wiper Lever? Today, Rabia Chaudry, Susan Simpson, and I appeared on The Docket with Seema Iyer. The full episode can be accessed by clicking on this link. Part of our discussion focused on the video taken of the "broken" windshield wiper lever in Hae Min Lee's Nissan Sentra. The background for that video can be found in this post. That post, of course, was written before we had the video. Now, we do. So, what does it show us? We know that the Sentra was released from police custody on March 7, 1999. From there, it was apparently taken to a body shop owned by Hae's uncle. Because it was clear that photographs taken of the car on February 28, 1999 did not show a broken lever, detectives went to the body shop on March 16, 1999 to record a demonstration. If the car were inside and secure, the State might have had an argument that the video should have been admissible despite the obvious chain of custody issues. In the video, one of the detectives -- presumably Detective Hastings -- simply walks up to the Sentra and opens the driver side door. The Sentra is only "secured" through a Club or similar device on the steering wheel. The blue Ford in question was taken to the garage at the Pennington County jail. The car was sealed with evidence tape and locked behind doors with electric locks. Deputy Pesecka personally observed all of this. The car was transported to Kadoka by one Mr. Wilcox who testified that the tape had been temporarily removed to prepare the automobile for towing, that it was resealed before towing, and that it was driven directly to and locked within the Jackson County garage in Kadoka. These procedures satisfy us that a prima facie showing has been made that the objects were properly identified and in the same condition as when the car was taken into custody. The problem in this case is that someone could have "tampered" with the steering column between March 7th and March 16th. Given that the Sentra was taken to a body shop, the "tampering" in question likely would have been someone working on the steering column...which someone clearly did. The other thing you might notice from this screenshot and the video from the episode (starting at about the 42 minute mark) is that the windshield wiper lever is multichromatic and/or that part of its casing is missing. Or you might conclude that this is simply an optical illusion based upon the way that the sun is striking it. What we do know is that the Sentra was outside, unlocked, and in the snow, with someone placing a Club on the steering wheel and replacing the ignition collar. * Given all of this, the video shouldn't have been given any legal or factual weight. 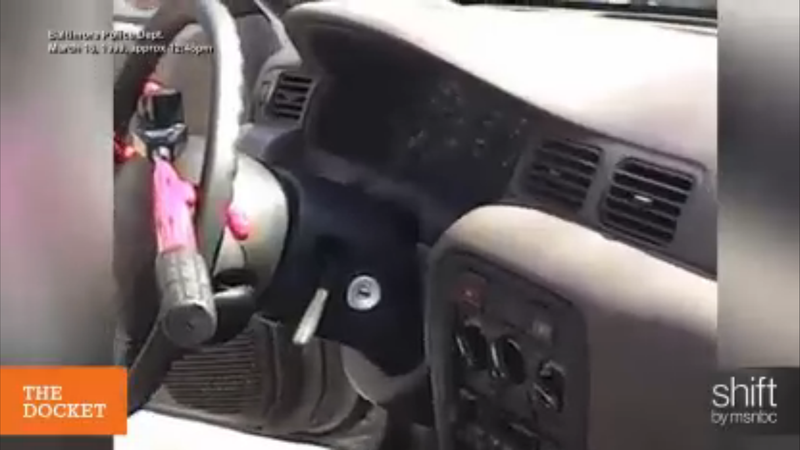 *We also know that Jay and Detective Forrester both alternatively claimed that the broken lever was on the right and left of the steering column and that Hae's brother has said that it was the turn signal lever (on the left of the steering column) that was broken. So when did you get the video, really? I see silver and black, not a reflection. Out of curiosity, is this the same uncle that contacted the Enehey group? carnotbrown: I don't know. The only reference we have to the body shop is in Detective Forrester's testimony, in which he says he thinks it was a body shop owned by Hae's uncle. I'm going with reflection - given the whole steering wheel suffers from a similar illusion (I guess no one's arguing the whole lot was replaced?!) And there does appear to be a texture change towards the end of the arm in the spare part photo. As an aside, it looks like the officers have walked to the car at least once prior to the video being taken, as there's already a trail in the snow. Cupcake: Yes, and it looks like Hastings was already playing with the lever before the demonstration started. I don't believe the missing collar indicates an attempt at hot wiring because you cannot access the wires. Usually you go under the steering column to access the wires. If (big if) the lever was broken in a struggle it's more than possible the collar was also smashed off. Wow. Looks almost like 2 completely different interiors. Nice work?? Hmm. Any chance that the lever was broken before this all took place? Was it ever asked? Could be possible she was driving with a busted lever prior. We've all been guilty of negligence on our cars at one point. Are those different radio/cassette players? The one in the photo looks like it has a ? improvised chrome flip switch, the one in the video looks like standard-issue 1999 Nissan Sentra kit. I know you are taking some heat on Reddit for your speculation that the different colours on the lever could be due to sunlight, but I'm inclined to agree with you, for two reasons. First, who would make a lever in two colours? And second, if you look to the part of the steering wheel assembly in the upper left, it is also showing a bright flash. From the photos of the car, it's hard to tell if it had a sunroof. Even if it didn't, bright late-winter sunlight meeting an obstruction could account for the effect. From this photo I think it is plain that the difference in shade is from strong sunlight reflecting, as you see an identical change in the shade and color of the steering column, steering wheel, and dashboard. How do you explain this same exact change otherwise? Furthermore why would a replacement lever be anything other than the standard black nissan lever? I don't think Nissan was in the business of maker multiple colored versions of windshield wiper controls. Also, the whole chain of custody concern you raise doesn't seem to apply here. Det. Forrester testified that the lever shown in the video was in the same condition as when originally observed on Feb. 28, so the grounds for admissibility are lain right there. Chain of custody is irrelevant unless you want to claim that Forrester is lying or somehow mistaken. It strains credulity far past its breaking point to me to argue that Forrester was utterly mistaken or lied about when he and the other detectives observed the broken lever on the 28th, and then returned to video the car and were mistaken again in remembering how it was broken or if. We have nothing, no evidence from which to dispute his account as truthful. Hi Colin. Was the ignition collar found in the car? A) Jay knew this detail from whoever killed Adnan? David Dredge: My understanding is that popping the ignition collar used to be the first step to hotwiring a car. So, maybe someone was playing by the old playbook. Kristin P: Or is it an optical illusion based on the sun? It’s so hard to tell. Pushead2: Yes, it’s certainly possible that it could have been damaged before January 13th. We know, for instance, that Hae had an accident when Adnan and Don looked at the car. WLJ: Good question. I need an automotive expert. Streetwriter: I’m definitely not wearing my legal cap for my opinion on the color(s), and I’m definitely not completely sold one way or the other. For what it’s worth, I was a white and gold dress person, and my vision is pretty bad. Ohdatsclever: It certainly could be the same lever. I don’t know whether there were bi-colored levers. As for chain of custody, the video was pretty clearly inadmissible. You’re almost always going to have someone from the State claiming it’s the same item in substantially the same condition. In this case, however, (1) the car was released from State custody to a private body shop for 9 days; (2) the car was outside; (3) the car was unlocked; (4) the ignition collar right next to the windshield wiper lever had been replaced; and (5) a Club had been placed on the steering wheel. It’s very easy to imagine a change in the windshield wiper lever, whether unintentionally or as part of an attempt to fix it or some other part of the car. Simply put, a proper objection would have resulted in exclusion. ScoutFinch2: I don’t recall any record of the ignition collar being found in the car. Someone can correct me if I’m wrong/forgetting something. S: I don’t have any one contention. I don’t know whether the windshield wiper lever was ever broken. If it was broken, I don’t know whether it was broken before, on, or after January 13th. I don’t know whether the lever was in the same condition on March 16th as it was on January 13th. I don’t know whether anyone at the body shop had tried to work on or replace the wiper lever. Basically, I don’t know what to make of the lever, and I don’t know how anyone could have any one conclusion. That’s the whole problem based on the chain of custody issues. This is not a sunlight artifact, that ignition collar was replaced and the lever is not an original to that car. What was Detective Hastings doing when he first opened the driver's side door? This video is a travesty and a mockery to any intelligent person who knows the details of this case. Great work Colin. Also, good catch by Cupcake, there is already a path cleared in the snow to the driver's side door meaning the detectives had already been creating mischief in there. Is it just me or does it look like in the March 16th video there is some sort of button or raised piece on the top of the lever, where in the original photo that part of the lever looks flat? Maybe the photo angle that it is hanging is different than the video angle? Colin, from the photos/video you have can you read either the mileage or the amount of fuel in the car? As per the question of ScoutFinch2 above regarding the discovery of the ignition collar in the vehicle: I believe it was found in the vehicle. This is the most likely conclusion we can reach based on the available evidence. Obviously the collar is missing in the first picture and has been “replaced” in the second pic. The reason I think the collar was found in the vehicle rather than replaced is the difficulty one would face in procuring a replacement part. Individual trim pieces like that are notoriously difficult to find. (go ahead and do a google search, keep in mind this was 1999, very much pre google that we know today) You don’t just go down to the neighborhood parts store and buy that piece. Something that specific would be a “dealer only” item and would almost certainly have to be special ordered from a regional warehouse. Dealers just don’t stock items like this because A) they are very rarely replaced and B) they come in a multitude of colors that match they various interior trim options. Usually the only other option would be a salvage yard (this would be unlikely because there are probably not going to be a bunch of ’98 Sentras sitting in junk yards in 1999). 1. Vehicle is released to the family and taken to the body shop owned by Hae’s uncle. Upon inspection of the vehicle it is determined that the missing ignition collar is a priority to be replaced. 3. While the shop goes to the trouble of special ordering the ignition collar they make no attempt to repair the obviously broken wiper switch for which the parts would be readily available from almost any parts dealer and which the repair would be straightforward and take less than an hour. It seems much more likely that someone made a cursory inspection of the condition of the vehicle, found the ignition collar somewhere in the floor board and simply snapped it back in place. It is frustrating that this question was not answered when the car was processed by the state because if the collar was found in the floorboard that tells us that it was almost certainly removed deliberately. Another poster suggested that it could have been damaged in a struggle as claimed by the state. In my experience this would not be the case. Trim pieces don’t just come off unless they are broken. And if they are broken you can’t just snap them back in. They are typically held in by plastic tabs that need to be gently pried back with a trim tool (a flat blade screw driver would work too in a pinch) to release them. All of this leads me to conclude that the collar was most likely removed deliberately and was found in the floor board and re-installed before the police came to take the video. As noted by Prof Miller above, removing the collar is the first step in hotwiring this car. The next step would be removing the lower half of the steering column trim held in by several screws to access the ignition switch wiring. As Prof Miller discussed in Undisclosed this is strong evidence that there was a possible interruption of an attempt to steal this car. Unfortunately, this is just one of many pieces of evidence that was not properly documented and was never explored by the police investigation. The above thoughts are based on 15 years of personal experience in the automotive industry. Colin: can't the mileage be seen on the video to compare to photos? Colin, I was going with the whole shadow theory until I watched the video. In the video, as they are flipping the lever up and down, the 'shadow' didn't change as it would if the sun were reflecting on it. I am convinced that that is a different lever! YouvebeenRitzed: Yes, I’d love to know what happened before the camera was turned on. Emily: Yeah, it’s really tough to say. Louise: It looks like the tank was 3/8 full. I don’t think you can see mileage. Brian: Thanks for the insight. Andrew: I haven’t seen the mileage, but maybe I need to look closer. Cathy McElhaney: I think we’re on the same page. I’d love some type of video expert to be able to say something definitively one way or the other. It doesn't even have to be the detectives. How was the lot secured where the car was parked? Homeless people have been known to sneak into unlocked cars to sleep. That's the reason that CoC is so important. Of course the detective is going to say it was in the same condition--the question is what basis does he have for saying that other than his ipse dixit? When the CoC is protected there is a basis for his testimony. No CoC it's idle speculation. The path through the snow to the driver's door doesn't appear to be there in the first screen shot; does the video show the path being made by someone trudging to the car? Or was recording paused and restarted around a time when the path was made?